Whether your wanderlust draws you to Europe, Africa or Asia, you’re sure to find your passion aboard an AmaWaterways River Cruise. With a wide variety of destinations, dedicated culinary and wellness cruises and endless options to customize your excursion, AmaWaterways proves that getting there can be just as exciting as being there. From the tulip fields of the Netherlands to the exciting Adriatic flavors of Croatia, AmaWaterways offers twenty-six excursion options throughout Europe. Journeying through the heart of Europe, you’ll have the chance to experience Belgium, Switzerland, Luxembourg, Austria, Germany, the Czech Republic, Hungary, Slovakia, Romania, Serbia and Bulgaria. We also offer dedicated cruises to France, including Paris, Bordeaux and Normandy, as well as to Spain and Portugal. If you’re eager to travel further afield, you’ll love our African and Asian options. 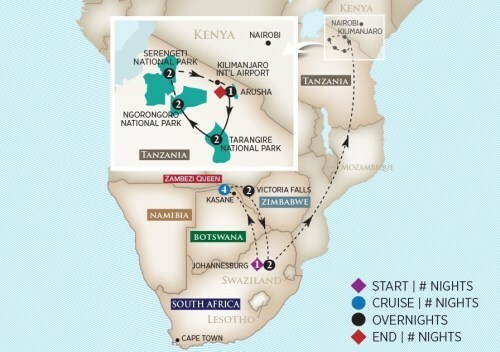 We offer five distinct packages touring the wildlife-rich and beautiful countries of Botswana, South Africa, Tanzania and Zimbabwe. 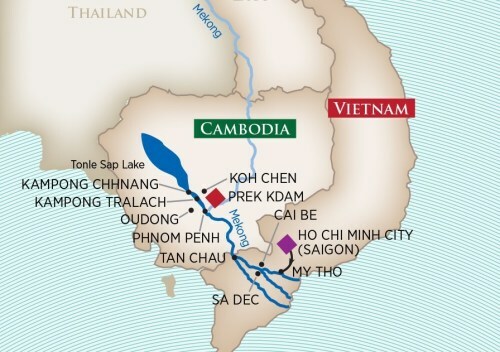 We are also proud to offer two distinctly different Mekong River cruises, taking you through the rich cultural and ecological environments of Vietnam and Cambodia. AmaWaterways is proud to offer Christmas cruises as well, making the most wonderful time of the year even more magical. 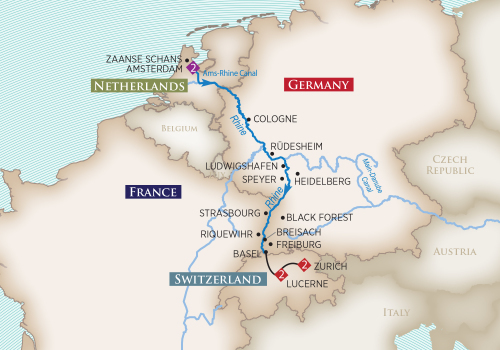 Choose from five distinct options journeying throughout Austria, the Czech Republic, Germany, Hungary, France, the Netherlands and Switzerland, visiting world-renowned Christmas markets and experiencing the season as never before. Wellness cruises are perhaps the most luxurious way to get or stay in shape. AmaWaterways offers eighteen of our already-legendary river cruises as Wellness Cruises, with on-board activities tailored to those seeking a healthier lifestyle. You’ll learn about healthy eating and relaxation techniques while visiting some of the most beautiful places in the world. Additional wellness activities are in addition to the wellness equipment already on our river boats, which includes fleets of stationary bicycles, fitness rooms, massage services, whirlpools, swimming pools and walking tracks. Culinary cruises offer unparalleled dining and learning experiences, enhanced by special guest Joanne Weir. Star of Plates and Plates on PBS, Weir is a James Beard Award-winning author of eighteen cookbooks and fourth-generation professional cook. Join her on our exclusive Taste of Bordeaux river cruise, which whisks you away to a world of chateaux, vineyards and regional delicacies along the Garonne and Dordogne Rivers. In addition to the incredible sights and luxurious accommodations, the appeal of a river cruise is a chance to go back in time. While traditional cruise ships are a wonderful way to travel, they are very large. In many ways, this is wonderful – an experience that shouldn’t be missed. However, their sheer size reflects the big world in which we now live, and require a certain size of port. River cruises allow you to glimpse the magic of life as it once was, when smaller rivers were the only means of long-distance travel. You’ll see and experience things which simply can’t be reached by a large cruise ship, including charming towns and villages well off the beaten path. In addition, we believe that on an AmaWaterways cruise, you’ll fall in love with the intimacy and personal service you can only find on a smaller vessel. Your stateroom will be your “home base” on board, and it’s a place you’ll love coming home to at the end of a day. Most staterooms feature twin balconies – traditional open-air and French – to let you customize your experience. In addition to allowing you incredible views and plenty of fresh air, the layout also means beautiful natural lighting. We believe that more room translates to a more luxurious experience. In honor of our commitment to our guests, we offer larger and fewer staterooms. We only carry a maximum of 164 guests per cruise, which means you’ll have more room to spread out and never worry about a crowd when taking advantage of our boats’ public areas. Staterooms range in size from a generous 155 to a whopping 350 square feet. In addition to size and views, your on-board accommodations will rival those of the finest five-star hotels. You’ll enjoy Egyptian linens and down pillows, in-room temperature control, luxurious dual-head showers, full-size bathtubs in select cabins, flat-screen television which doubles as a computer, wardrobe, full-length mirror, hair dryer, complimentary bottled water, on-demand entertainment options including movies and music, complimentary Internet and Wi-Fi and much more. Suites offer a full-size sitting area. For relaxation outside your stateroom, take advantage of our sparkling sun deck pool with swim-up bar, indulge in an expert massage or work up a sweat in the fitness center. Customization is also key when it comes to the concept of more, and our options never disappoint. We understand that, on the same cruise, we will entertain guests who have never visited a particular region as well as seasoned travelers who have enjoyed it several times over. To ensure new experiences for all guests, we offer tours which take first-time travelers to the major “must see” spots in a particular city or region – ideal ways to get acquainted with an area. For those who have visited the region previously, we offer a wealth of specialty tours which are off the beaten path. Further customization is available through our choices of Gentle, Regular and Active tours, which offer something for every imaginable age and physical condition. All of AmaWaterways tours are led by experienced and knowledgeable English-speaking guides to ensure you don’t miss a thing. Proudly offering the first river cruise experience which includes a full fleet of on-board bicycles, we encourage AmaWaterways passengers to see the world the way the locals do. Some of the most beautiful places simply can’t be reached by bus or car, but our guided bicycle and walking tours bring you to the heart of the action. In addition to being a wonderful way to see otherwise-hidden sights, these tours are a great way to pack even more activity into a Wellness Cruise. If you’d like to extend your experience of a region even more, we offer exciting add-on land packages for the beginning of your trip, end or both. These enriching packages give you a chance to really experience an area, sightseeing at your own pace and immersing yourself in local atmosphere. As an honored member of the Chaines des Rotisseurs, the oldest and largest food and wine society in the world which dates back to Paris of 1950, AmaWaterways offers a culinary experience like none other. In addition to the incredible regional delicacies you’ll sample during land excursions, your on-board dining will be just as memorable. All dining and drinks are included, which means you can indulge whenever and wherever you like. Our expert chefs offer a range of selections which include traditional Western fare alongside regional specialties. Dine at the exclusive Chef’s Table restaurant to watch your chef prepare your meal right in front of you, or pick up some incredible snacks at the Main Lounge to enjoy any time or day. We believe that fine dining and incredible beers and wines enhance the travel experience, and we think you’ll agree. Dining areas are further enhanced with live music every night, varying between contemporary favorites, local musicians and everything in between. 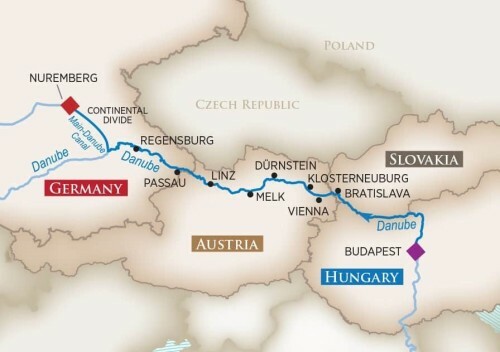 At AmaWaterways we believe that more is more – although not necessarily bigger. You’ll find more experiences, more enjoyment and more relaxation than you thought possible packed into every one of our award-winning and extensive fleet of smaller river boats, offering unparalleled guest services and memories to last a lifetime. AmaWaterways is dedicated to guest services. We treat guests as family, and boast a very uncommon one-to- three staff ratio. This means you’ll never feel lost or forgotten when traveling with AmaWaterways. We also offer the security of having the same expertly trained Cruise Manager organize both your on-board and land excursions. While each cruise, customized package and excursion is unique, let us take this opportunity to showcase what one day on our acclaimed Gems of Southeast Europe journey may look like for you. This package is particularly exciting, as it highlights some countries which weren’t often seen as destinations just a few short years ago. Nonetheless, they are jam-packed with incredible cuisine, fascinating culture and stunningly beautiful natural and man-made attractions. To start off, you may choose to begin your cruise with a two-night stay in either Vienna or Budapest and one in the Transylvanian mountain village of Brasov. Your cruise begins in Budapest, sailing the Lower Danube – one of the most historic rivers in all of Europe. Your first day will include getting settled on board and meeting your fellow travelers. Throughout your trip, excursions will include Pecs, Mohacs, Belgrade, Vidin, Rousse, Belogradchik, rock-hewn Churches and sailing through the fabled Iron Gates, to name just a few. To highlight your extensive options, take Day Three – you’ll experience the gorgeous Croatian city of Vukovar, indulging in either a traditional City Tour or exclusive wine tasting. The same day will see you in Ilok and Novi Sad, choosing between walking, biking or hiking tours and finishing your day with a visit to the Petrovaradin Fortress, nicknamed the “Gibraltar of the Danube,” a 16th-century wonder nestled along the banks of the Danube. As you can see, each day with AmaWaterways is packed full of excitement, enjoyment and experiences you’ll never forget. We hope to see you soon! Let the experienced team of cruise enthusiasts at Port & Porters help you curate your bespoke journeys.